Quilts are more than cheery patterns and the equivalent of a fabric hug: They tell stories. The 5Bee Quilters Guild, a local organization, is featuring its handcrafted quilts at the Trailing of the Sheep Festival’s first Quilt Show on Saturday, Oct. 11, at the Hailey Armory, next to the Folklife Fair at Roberta McKercher Park in Hailey from 10 a.m. to 4 p.m.
A growing trend at quilt shows is the “bed turning” ceremony. The local quilters guild is holding its own turning event, one at 11 a.m. and one at 2 p.m. The guild will make a bed with layers of quilts and proceed to turn back the quilts layer by layer to tell stories about each piece of work. The work and craftsmanship that goes into quilt-making delves into the personal experiences of the creator. It’s fun for experienced quilters, because they understand the work that goes into each creation. Yet it’s also fun for non-quilters who are curious about fabric artwork and the meaning behind specific designs and patterns. The 5Bee Quilters Guild is involved in numerous community events. The group hosted a quilt raffle at this year’s Northern Rockies Music Festival in Hailey and holds regular meetings for enthusiasts. The show includes a raffle with a handful of prizes. The most coveted raffle prize will be a sheep-themed quilt created by Kathy Etcheverry. Etcheverry and her husband, Steve, own Etcheverry Sheep Sheds, one of the last local Basque sheep ranches in Idaho. Steve inherited the Rupert sheep business from his father, Jean Pierre. The Etcheverrys sell their wool to Pendleton Woolen Mills and their lambs through Mountain States Co-op. 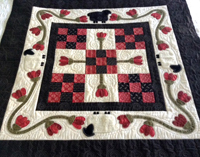 Kathy’s quilt features four sheep bordered by pink and red flowers. She spent more than $200 on materials for the quilt, and “countless hours” of labor went into the project, according to Trailing of the Sheep Festival Executive Director Mary Austin Crofts. Crofts said including a quilt show in the annual October festival brings an added level of talent to the festivities. She views the 5Bee Quilters’ creations as works of art. A Pendleton blanket, a coat rack, a birdhouse and restaurant vouchers are among the raffle prizes. Tickets are $5 each or five for $20. They will be for sale at the festival merchandising and information tables. To get involved with the 5Bee Quilters Guild, send an email to 5beequiltersguild@gmail.com.